Navman GPS 3450 is a convenient, powerful and easy-to-use personal navigation solution. 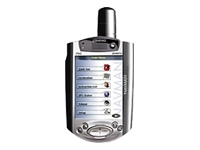 Whether driving across country, walking around town or anything in between, the Navman GPS 3450 includes everything needed to turn a HP iPAQ Pocket PC into a complete street navigation solution. Navman's SmartST Professional travel navigation software, a windshield mounting bracket and vehicle power adapter are also included so you have everything you need, to know where you are, and get where you are going. HP/Compaq iPAQ H3600, H3700, H3800, H3900, H5400 series.